An independence referendum for Iraqi Kurdistan was held on 25 September 2017, with preliminary results showing approximately 93 percent of votes cast in favour of independence. Despite reporting that the independence referendum would be non-binding, the semi-autonomous Kurdistan Regional Government (KRG) characterised it as binding, although they claimed that a positive result would trigger the start of state building and negotiations with Iraq rather than an immediate declaration of independence. The referendum’s legality was rejected by the federal government of Iraq. It was originally planned to be held in 2014 amidst controversy and dispute between the regional and federal governments. Calls for Kurdish independence had been going on for years, with an unofficial 2005 referendum resulting in 98% voting in favor of independence.These longstanding calls gained impetus following the Northern Iraq offensive by Islamic State in Iraq and the Levant during the Iraqi Civil Warin which Baghdad-controlled forces abandoned some areas, which were then taken by the Peshmerga and controlled de facto by the Kurds. The referendum was announced and delayed on several occasionsas Kurdish forces co-operated with the Iraqi central government for the liberation of Mosul, but by April 2017, it was being seen as happening some time in 2017. On 7 June 2017, Kurdish President Masoud Barzani held a meeting with the Kurdistan Democratic Party (KDP), the Patriotic Union of Kurdistan (PUK), and other ruling parties, where the independence referendum was confirmed to be held on 25 September 2017. The Kurdistan Regional Government had criticised Iraqi Prime Minister Nouri al-Maliki, claiming that his rule was divisive.After the central government began withholding funding to the Kurdistan Regional Government in January 2014, the KRG attempted to export oil via the northern pipeline into Turkey in May, but the Iraqi government lobbied international governments to block the export and sale of this oil. The flag of Kurdistan flies over the disputed city of Kirkuk after it was abandoned by Iraqi forces in June 2014 as the ISIL militant group approached. As jihadis affiliated with the Islamic State of Iraq and the Levant (ISIL) took control of much of western and northern Iraq in June 2014, the Iraqi military in those areas largely disintegrated and abandoned their positions. The Peshmerga stepped into this vacuum, taking control of the city of Kirkuk and other northern areas long claimed by the Kurdistan Regional Government but until then outside its formal control. In these disputed areas, Kurdish forces under the regional government spearheaded a “concerted campaign” to displace Arab communities in northern Iraq, actions that could amount to war crimes, according to a report by Amnesty International. Nouri al-Maliki’s government was widely blamed for the failure of the security forces and for Sunni Arab dissatisfaction with the central government, and international and domestic calls for a new prime minister became widespread. On 1 July, Kurdish president Masoud Barzani announced his intention to call a referendum on independence sometime in 2014 on the grounds that the country had been “effectively partitioned” already. In September 2014, after Maliki was replaced as prime minister by Haider al-Abadi, Kurdish leaders agreed to postpone the referendum while they focused on the fight against ISIL. On 3 February 2016, Rudaw.net reported that Iraqi Kurdish leader Masoud Barzani told KRG legislators that the referendum would be held sometime before the 2016 American presidential election in early November. On 23 March, Barzani said, in an interview with Al-Monitor media website, that the referendum would take place before October 2016. However, in late October, Iraqi Kurdistan Prime Minister Nechervan Barzani confirmed that the referendum would not be held until after Mosul had been liberated. In August 2016, Haider Al-Abadi said that he saw self-determination as an “undisputed right”. News reports from December 2016 said Iraqi Kurdistan’s Prime Minister Nechirvan Barzani had suggested the region could push for independence from Baghdad once the ongoing battle to liberate Mosul from the Islamic State of Iraq and the Levant was complete. In early April 2017, as the liberation of Mosul was progressing, the ruling political parties of Iraqi Kurdistan, the KDP and PUK, announced their goal of holding an independence referendum in 2017. On 7 June 2017, Kurdish President Masoud Barzani announced that the referendum would take place on 25 September 2017. Barzani’s assistant Hemin Hawrami said the referendum will also take place in Kirkuk, Makhmour, Sinjar and Khanaqin regions. All of these areas are disputed and are claimed by the central government. Senior Kurdish official Hoshyar Zebari said a “Yes” vote in the referendum wouldn’t mean an automatic declaration of independence, but will “strengthen the Kurds’ hand” in talks on self-determination with the central government. On 14 August, a delegation from the KRG met with Prime Minister Abadi and Vice-President Maliki in Baghdad to discuss the upcoming referendum and affairs between the KRG and Iraq. Romeo Hakkari, the Assyrian/Chaldean/Syriac representative of the delegation and head of the Bet-Nahrain Democratic Party said that in addition to the meeting with Iraqi officials, they would meet with foreign missions in Baghdad. The KRG said referendum planning and implementation of the vote was up to the local councils of the disputed regions.The Shingal District Council expressed its support on 30 July for the KRG’s efforts to include the Shingal area in the referendum. The Mayoral Council of Khanaqin on 16 August discussed the issue and decided to hold the referendum in their region. The Bashiqa Town Council voted the next day and decided to take part in the referendum. After a rare high-level meeting between the Iranian military chief of staff Major General Mohammad Bagheri and Turkish President Recep Tayyip Erdoğan in Ankara on 16 August, a joint statement “voiced strong opposition” to the referendum. The local council of Mandali, whose population includes both Arabs and Kurds, had voted to in favour of including the town in the referendum on 17 August. Arab residents however protested against the decision on 10 September. A day later, the city council withdrew the decision of participation in the referendum while Mandali’s mayor, Hoshiya Ismail, was dismissed from his position. On 29 August, the Kirkuk Provincial Council voted on the issue of holding the referendum in Kirkuk. Of the 41 council members, 24 attended with 23 voting in favor of holding the referendum while one abstained. The remaining 17 members, all of whom were Turkmen and Arabs, boycotted the vote. On 14 September, the Iraqi parliament voted to dismiss Najmiddin Karim as the Governor of Kirkuk, a decision requested by al-Abadi after Kirkuk’s provincial assembly voted to take part in the referendum. Karim said he will not follow the dismissal order and will stay in office. The provincial council meanwhile condemned the decision of the parliament with council head Ribwar al-Talabani claiming only the council had the power to remove him. Campaigning for the referendum officially began on 5 September. The region’s electoral commission said the campaigning would last for 18 days with the Iraqi Kurdish diaspora being able to vote on 23 September, two days ahead of the main poll. The Iraqi parliament rejected the referendum on 12 September. The Iraqi Kurdistan Parliament approved a plan to hold the referendum on 15 September. 68 out of 111 lawmakers attended the session with Gorran boycotting it. Iraq’s Supreme Court on 18 September ordered the suspension of the referendum to examine its constitutionality. Barzani however vowed to go ahead with the referendum. It has been reported that pro-AKP news outlets in Turkey including Yeni Akit, Aksam, Internet Haber and Yeni Safakhave been circulating a fake news story about “Zionist support” for an “insidious Kurdish plan” by Barzani and Kurdish Jews to settle 200,000 Jews in the region should Kurdistan become independent. The report has been disputed, including by Kurdish analysts, as baseless and fake news, and has been described as part of a media offensive by Turkey against Israel, while Kurdish analyst Diliman Abdulkader considers the reports an attempt to “destroy Kurdish credibility in the region by the association them with Israel and playing on local prejudices against people of Jewish faith”. Turkey decided to remove broadcaster Rudaw Media Network (Rudaw), which is affiliated to the Kurdistan Regional Government (KRG) in northern Iraq, from its satellite broadcasting on the same day voting took place on the independence referendum in the KRG. One poll, held between 25 August and 27 August, which covered the provinces of Arbil, Sulaymaniyah, Duhok, Halabja and Kirkuk, as well as the cities of Khanagin, Jalawla and Mandali within Diyala, showed intention to vote yes at 52.9%, intention to vote no at 25.6%, 3.6% not voting and the remainder of 17.9% being undecided with most of these indicating that they intended to vote yes but were also carefully watching the situation in case it deteriorated. The ballot was available in Kurdish, Arabic, Turkish and Assyrian. Do you want the Kurdistan Region and the Kurdistani areas outside the region’s administration to become an independent state? Aya detewê herêmî Kurdistan u nawçe Kurdistaniyekanî derewey herêm bibête dewlletêkî serbexo? Hal turīd an yaṣbaḥ iqlīm kūrdistān wal-manāṭaq al-kūrdistānīyah khārij al-iqlīm dawlah mustaqillah? Kürdistan Bölgesi ve bölge idaresinin dışında kalan Kürdistanlı yörelerin bağımsız devlet olmasını istiyor musunuz? Ārā bʿē ānt d’eqlēymā d’kūrdestān w’penyāṯā kūrdestānāyē l’ḇadar mdabrānūṯā d’eqlēymē d’payši aṯrē šaliṭ b’yāṯā? Jordan: Jordanian Foreign Minister Ayman Safadi said the referendum was an internal Iraqi affair. Syria: Adviser to the Council of Ministers Said Azzouz said any unilateral action is rejected and that Syria cannot accept the division of Iraq, and that independence needed legal provisions from the Iraqi constitution. Turkey: The Turkish Ministry of Foreign Affairs announced that the Iraqi Kurdish Regional Government‘s decision to hold an independence referendum was a “grave mistake”. On 19 July 2017, Ambassador Hüseyin Müftüoğlu, in response to a question regarding the claims in the KRG press, claimed that they were distorting Turkey’s position against the KRG’s referendum decision. Turkish Prime Minister Binali Yıldırım has said: “A decision by the authorities in the Kurdistan Region to hold a referendum on the independence of Kurdistan on September 25 is irresponsible”. An AKPMP Mehmet Galip Ensarioğlu said: “People should respect the decision of the people of Kurdistan”. The head of the Nationalist Movement Party, Devlet Bahçeli, said, “Let us look at the national unity of our country, the Barzani gang would make a referendum on independence on September 25th, which is called disgrace, shame and betrayal.” The left-wing Peoples’ Democratic Party supported the referendum. President of Turkey Recep Tayyip Erdoğan said the referendum wouldn’t serve anyone’s interests, calling it a threat to the territorial integrity of Iraq and expressed regret over it. On 14 September, the Foreign Ministry of Turkey warned Iraqi Kurdistan that it would “pay dearly” if the referendum was not abandoned. On 26 September, Erdoğan called the referendum decision “treachery” and said economic and military measures could be used against the Iraqi Kurds. Turkey halted the flights of the Turkish airline companies to northern Iraq on September 29, 2017, until further notice at the request of Baghdad, following the referendum. Armenia: Armenian Foreign Affairs Ministry Eduard Nalbandyan said it hopes for a pacific settlement of the situation in connection with the Iraqi Kurdistan referendum on independence. He also states that Armenia expects the Iraqi authorities and the regional authorities of Iraqi Kurdistan to be able to avoid tension, and find the avenues for resolving the matters. Australia: A spokeswoman for the foreign affairs department said in a statement, “Holding a referendum at this time risks causing further instability in Iraq that would weaken both the Iraqi government and the Kurdistan regional government”. Belgium: In an interview with NRT News after meeting Deputy Prime Minister of KRG Qubad Talabani, Deputy Prime Minister of Belgium Jan Jambon said all nations have the right to self-determination. Belgian ambassador to Iraq Hendrik Van de Velde said Belgium did not have an official stance on this issue. Bulgaria: Bulgarian Prime Minister Boyko Borisov said Bulgaria had listened to President Barzani when he visited the country in May 2017, but had no official stance on this issue. Canada: Prime Minister Justin Trudeau remained neutral about the referendum process and did not get involved, citing the Quebec sovereignty issue. Trudeau said he is sensitive to other countries getting involved in another country’s internal decisions and that he will respect the process established by the Kurds. China: Foreign Ministry spokesman Lu Kang expressed support to Iraq’s territorial integrity but asked for an open dialogue in a daily news briefing. Germany: Germany warned against Erbil making a unilateral decision in a “one sided” referendum. Greece: Greek Foreign Minister Nikos Kotzias said Iraq’s unity should be desired by the people themselves and that the Kurdish referendum is a right under the Iraqi constitution. During a meeting discussing the upcoming referendum, Greek Ambassador to Iraq Dionyssios Kyvetos announced that Greece was upgrading its diplomatic representation in Erbil to a consulate. Netherlands: Dutch Consul General to Kurdistan Region Janet Alberda said the referendum would be more accepted, if it was coordinated with Baghdad. Poland: Deputy Marshal of the Sejm Stanisław Tyszka said Poland would approve the referendum. Foreign Minister Witold Waszczykowski said he “perfectly understand the ambitions of Kurds”, but urged Kurdish officials to cooperate with others. Russia: Russian President Vladimir Putin commented on the issue by stating that Russia understands the sensitivity around the Kurdish cause and that their position is that the referendum should be within international law. Spain: The Spanish Foreign Ministry released a statement saying “This referendum is illegal in accordance with the Iraqi constitution of 2005, which received broad support from the population. Now all the people of Iraq must join forces to defeat ISIL once and for all, to build the country for the benefit of the entire population”. Sweden: Both governmental parties; the Social Democratic Party and the Green Party have expressed their support for the referendum. Opposition parties Sweden Democrats and the Left Party have also uttered their support. United Kingdom: On behalf of the British government, British consul to Kurdistan Region Frank Baker said the United Kingdom recognises “the inalienable right of everybody around the world to be free and to decide on their own governments”, but that it’s not the right time for this. He said a referendum should be held with Iraqi consent. Secretary of State for Foreign and Commonwealth Affairs Boris Johnson echoed the position, stating that “a referendum at this time will distract from the more urgent priorities of defeating Daesh, stabilising liberated areas and addressing the long-term political issues that led to Daesh’s rise”. United States: US State Department spokeswoman Heather Nauert said: “We support a unified, stable and a federal Iraq. We appreciate and understand the legitimate aspirations of the people of the Iraqi Kurdistan.” Nauert warned that the referendum could distract from the final defeat of ISIL. “We have expressed our concerns to the authorities in the Kurdistan Region, but holding a referendum even a non-binding resolution at this time would distract from urgent priorities and that be the defeat of ISIS, the stabilization, the return of displaced people, managing of the region’s economic crisis, and resolving the region’s internal political disputes,” she said. Negative reaction from the U.S. State Department is likely due to the United States’ military alliance with Turkey. United States Senator and Senate Minority Leader Chuck Schumer(D–NY) on September 27 became the first senator to call for US support for Kurdish independence following the results of the referendum, releasing a resolution calling for the US government to change its policy to “support a political process that addresses the aspirations of the Kurds for an independent state”, reasoning that the KRG had been “our most supportive partners on the ground in the fight against terrorism”, and said that “neighboring countries… led by despots, who oppose a Kurdish state because it threaten’s their self-interests, need to respect the need for the Kurds – and the Iraqis – to determine their own future”. He called upon Iraq to ““engage in a dialogue and peacefully determine the best way to accommodate the well-deserved and legitimate aspirations of the Iraqi Kurds”. On September 30, Secretary of State Rex Tillerson stated, “The United States does not recognize the … unilateral referendum. … The vote and the results lack legitimacy, and we continue to support a united, federal, democratic and prosperous Iraq”. Catalonia: Artur Mas, leader of the Catalan European Democratic Party and former president of Catalonia, said that he supported Kurdistan’s bid for independence and applauded Kurdistan’s leadership for “defending democracy”. A Catalan independence referendum happened on 1 October 2017. Québec: Stéphane Bergeron, a member from the provincial opposition Parti Québécois, has expressed support for Kurdish people to express their right to self determination. Republic of Artsakh: The Ministry of Foreign Affairs of Artsakh said it welcomes the results of the independence referendum. Iraqi Communist Party uttered support for the referendum and said it is “a fundamental right of the Kurdistan Region” to hold a referendum and hopes for Iraqi support. The Chieftain of the Arab tribe Jubur in Kirkuk has expressed support for the referendum and urged members of the tribe to vote yes. Iraqi Turkmen Front said, “The referendum decision is clearly against the constitution. In addition, the participation of non-Kurdish regions in the referendum is unilateral and the Arabs’, Turkmens’ decisions are against the wishes of the Kurds.” The Iraqi Turkmen Front said it would not recognize the referendum. Iraqi Turkmen leader Arshad al-Salihisaid: “Holding this referendum at such a sensitive time is dangerous, the ITF is deeply concerned about this. The Kurds could end up forfeiting the significant political and military gains they have achieved in recent years. Kurdish political parties don’t even seem to agree on the issue, while Kurdistan Islamic Group, along with the Movement for Changeoppose the referendum altogether”. President of the Iraqi National Accord Ayad Allawi warned Kurdistan Region “not to ponder separation”. Chaldean Syriac Assyrian Popular Council: Loay Mikhael, a representative from the CSAPC sid the council was supportive of the referendum as the Kurds have a right to self-determination. The council also calls for an Assyrian governed province in the Nineveh Plain to geographically join the KRG. Bet-Nahrain Democratic Party: Romeo Hakkari, leader of the Bet-Nahrain Democratic Party, has come in support for a Kurdish independent state while also maintaining a strong stance for a Christian governed province in the districts of Tel Keppe, Al-Hamdaniya and Al-Shekhan in the Nineveh Plain. He insists that there should be a separate referendum or option to elect for a Nineveh Plains province in the disputed area. Assyrian Democratic Movement: ADM has rejected the Kurdish referendum in the disputed area of the Nineveh Plain and instead calls for an Assyrian self-governed province part of Iraq. Palestine Liberation Organization Secretary General Saeb Erekat is opposed to Kurdish self-determination: “Kurdish independence would be a poisoned sword against the Arabs.” But Taysir Khalid member of Executive Committee of the Palestine Liberation Organization and also Democratic Front for the Liberation of Palestine declared support from the referendum and said “Kurdistan and Israel are completely different all respects”, in opposition to Nouri al-Maliki who said that Kurdistan will be a “second Israel” in northern Iraq. Following the referendum, the Kurdistan Regional Government started making plans for state building and future negotiations with Iraq before a declaration of independence for Republic of Kurdistan would be issued. Iraq demanded that the Kurdistan Regional Government hand over control of its two international airports by 29 September or face a shutdown of international flights. The Iraqi government also threatened to send troops to Kirkuk, a city with rich oil deposits. Troops also blocked routes between Mosul and Dahuk on the day prior to the referendum. Following the referendum, wild celebrations erupted in Iranian Kurdistan and two days of pro-independence demonstrations, which included the singing of the anthem of the Republic of Mahabad, occurred in the Kurdish cities of Baneh, Sanandaj and Mahabad, leading to mass arrests. 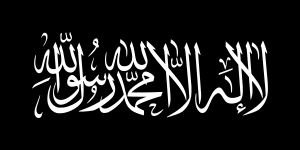 The Shahada flag commonly used by al-Qaeda. Dilshad Kalari (Unknown to Unknown): Very little is known about Kalari although some sources believe him to be the operational leader of AQKB. Abdullah Hassan al-Surani (2007 to Unknown): Surani has released public statements of behalf of AQKB and is believed to be the group’s official spokesman. al-Qaeda in the Kurdish Battalions (AQKB) is a militant Islamist organization,primarily active in the northern Iran–Iraq border. It is the Kurdish branch of al-Qaeda that has launched several attacks on the Kurdistan Regional Government in northern Iraq. The group was classified as a terrorist organization by the US State Department on January 1, 2012. AQKB was founded in 2007, after the apparent disbandment of Ansar al-Islam, another al-Qaeda-affiliated group. The group is considered to be relatively small, but it has camps in the Iranian towns of Mariwan and Sanandaj. The group has launched several attacks, including its largest one being against KRG‘s Ministry of Interior in Erbil that killed 19 people in May 2007. AQKB killed 7 border guards and one PUK security officer in Penjwan in July 2007. In September 2010, two police officers were hurt by a failed suicide attack in Sulaymaniyah. 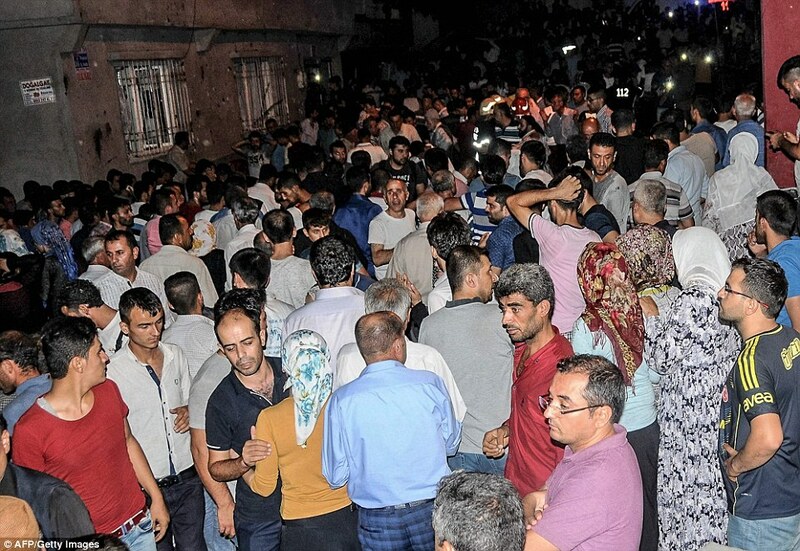 At least 51 people have been been killed and nearly 100 injured after a Muslim child suicide bomber ripped through a Kurdish Muslim wedding party. 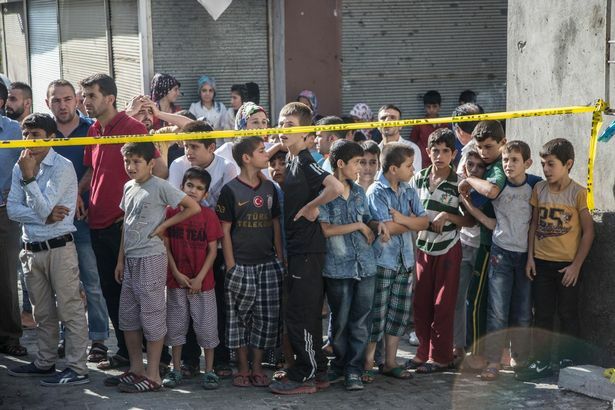 Turkish president Tayyip Erdogan said it was likely (but not confirmed) that ISIS was behind the attack which saw the bomber, a young boy, thought to be aged between 12 and 14, blow himself up among people dancing in the street in the city of Gaziantep. UK Daily Mail Horrified witnesses to the attack in Gaziantep on Saturday said there was “blood and body parts everywhere.” TheMuslim terrorist attack is the deadliest bombing this year in Turkey, which faces threats from militants at home and across the border with neighbouring Syria. 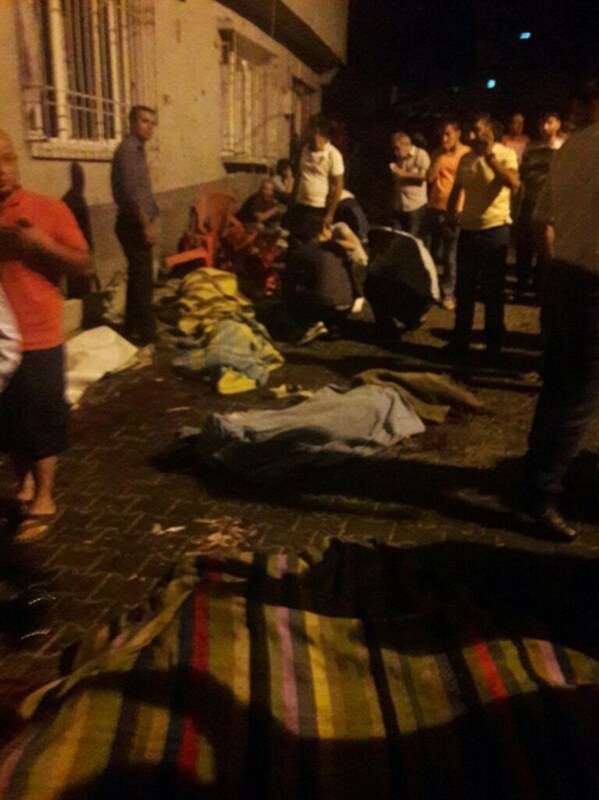 Horrified witnesses to the attack in Gaziantep on Saturday said there was “blood and body parts everywhere.” Blood stains and burns marked the walls of the narrow lane where the wedding party was attacked while women in white and checkered scarves cried sitting crosslegged and waiting outside the morgue for word on missing relatives. ‘The aim of terror is to scare the people but we will not allow this,’ said Deputy Prime Mehmet Simsek, who also represents Gaziantep in the Turkish parliament. ‘It is barbaric to attack a wedding,’ he told Turkish television. Simsek later traveled to Gaziantep along with the country’s health minister to visit the wounded and inspect the site of the attack. 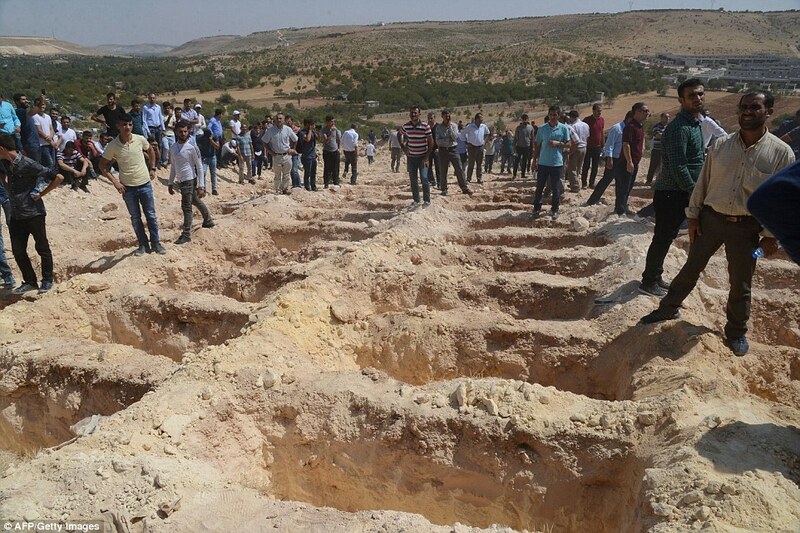 ‘This is a massacre of unprecedented cruelty and barbarism,’ he told reporters in Gaziantep. ‘We … are united against all terror organizations. They will not yield.’ He told reporters it was too soon to say which organization was behind the attack. Prime Minister Binali Yildirim condemned the bombing that turned ‘a wedding party into a place of mourning’ and vowed to prevail over the ‘devilish’ attacks. Governor Ali Yerlikaya told Anadolu Agency the attack took place in Akdere neighborhood of Sahinbey district on the southern outskirts of the city. 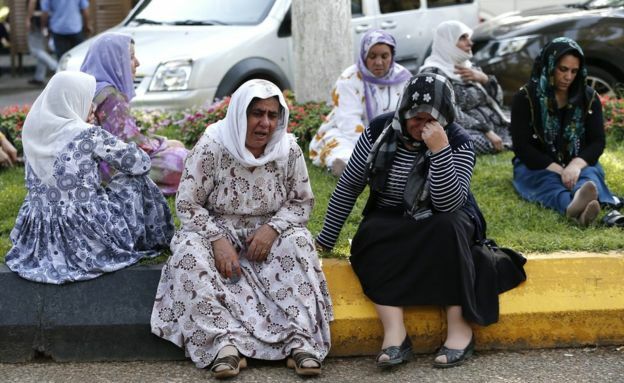 The lawmaker added that it was the type of attack that could have been launched by the Islamic State (IS) group or the Kurdistan Workers’ Party (PKK). ‘The explosion took place during a wedding. According to initially available information, the ceremony was being held outdoors,’ the official said. Just north of the Syrian border, Gaziantep has become a major hub for Syrians fleeing the civil war in their country’s civil war. Turkey has already been hit by a bloody year of militant attacks in its two biggest cities that have left dozens dead. Kurdish militants have twice struck in Ankara in deadly attacks, while IS suicide bombers have twice killed tourists in the centre of Istanbul.